Safe Kids Upstate NY is a grass roots coalition that advocates and educates to prevent unintentional injuries of children 14 and under. 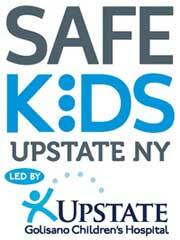 Safe Kids Upstate NY Coalition's members include; health and safety experts, educators, corporations, foundations, governments and volunteers coming together to educate and protect families. Safe Kids Upstate NY is a member of Safe Kids Worldwide, a global network of organizations dedicated to preventing accidental injury. We know our efforts are needed because as many as 90% of accidental injuries can be prevented. Coalition members include; health and safety experts, educators, corporations, foundations, governments and volunteers coming together to educate and protect families.